The C.S.A. Leadworks at Petersburg were constructed by Josiah Gorgas, head of the Ordnance Bureau, in summer 1862 in order to provide a vital material for small arms and artillery ammunition. 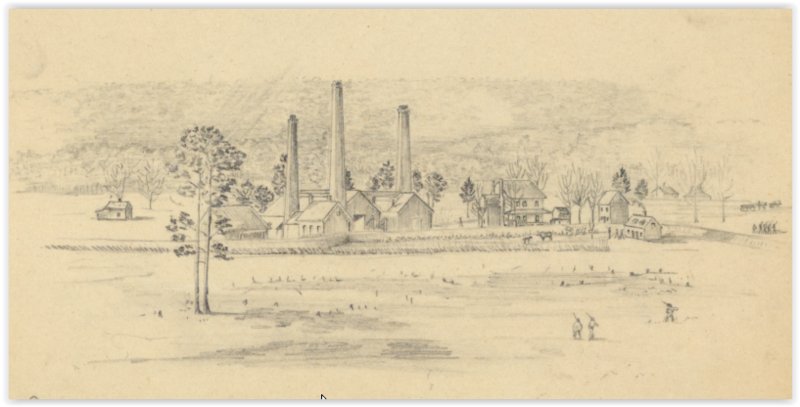 Gorgas, a West Point graduate from Pennsylvania, used his pre-war experiences at U.S. arsenals to develop this new smelting capacity for the South. The works were located near the Weldon Rail Road and Halifax Road southwest of the city. Lead ore was transported to Petersburg via rail and lead ingots sent to Richmond,also via rail (Henderson 1998: 56; Greene 2006: 87-88). ​...General Gracie's brigade collected 1,000 shells and solid shot yesterday, together with 350 or 400 pounds of lead; the other commands were also engaged in the same manner but have not yet forwarded detailed reports.... (OR XL, Part I, 782). Petersburg in the Civil War, William D. Henderson, H.E. Howard, Lynchburg, VA., 1998. Civil War Petersburg, A. Wilson Greene, University of Virginia Press, Charlottesville, VA, 2006. NARA, College Park, Michler Sheet 11. 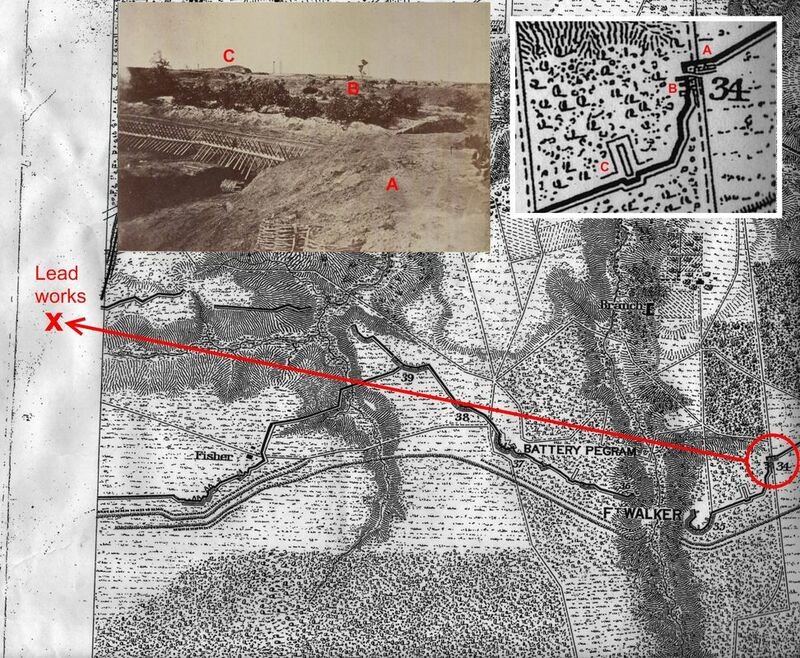 By 1864-65 the lead works were protected by an exterior line of fortifications that ran from Battery 38 to Fort Lee. The new line encompassed the Fisher house "Breezy Hill." …I accompanied one of the boys of the Signal Station a short time ago and climbing the tree was amply repaid for my pains by a glorious view of the enemy’s line and country southwest of Petersburg. I took a sketch of a portion of their works taking in their famous lead works, with the aid of a powerful telescope which brought the objects out as plain as if I were standing within fifty yards of them….(p. 308). Rare Books and Special Collections, Princeton University Library as published in "A Grand Terrible Dramma": From Gettysburg to Petersburg: The Civil War Letof Charles Wellington Reed, edited by Eric Campbell, Fordham University Press, 2000. Detail from Charles Wellington Reed drawing, captioned, "Lead Works South West of Petersburg, inside reb lines". Manuscript Division, Library of Congress. USAHEC Mass. MOLLUS collection, vol. 6, no. 292. Labeled "Fort Sedgwick." "Lead Works" added as an annotation above the chimneys on the horizon. Detail of photograph taken from the Peebles Farm Signal Tower, spring 1865, with buildings and stacks of the C.S.A. Leadworks in the distance. Library of Congress, cw04090. 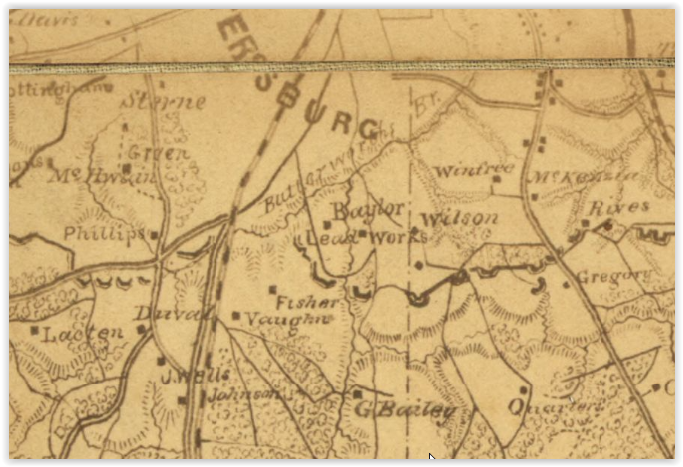 ​It was the middle of a war and you would think it was important to know the location of a government facility that supplied the war effort; however, the series of four versions of a map of the "Vicinity of Petersburg" from the Chief Engineers Office, Department of Northern Virginia, prepared in 1864, place the leadworks about a half mile east of its actual location. Detail, retrieved from the Library of Congress .